The CMOT project aims to tailor and develop solution based metal oxide thin-film transistors (MOTFTs) with graphene electrodes for the field of flexible, low-cost electronics. For this purpose, work-function engineering of both graphene and reduced graphene oxide electrodes was carried out. Additionally, the reduction of processing temperatures is of vital interest for flexible substrates. Thus, a laser-based technology for reduction of graphene oxide, conversion of the solution based metal oxide precursor and patterning of graphene electrodes and metal oxide semiconductor was developed. The interim results of the project are both of scientific and industrial interest. Several conference contributions as oral [1, 2] and poster presentation [3, 4] have been given. Also one paper for peer review has been submitted . The results concerning the technology of flexible beam shaping for thin film structuring, which was set up and evaluated by LPKF, show it can be deployed for several areas of laser material processing. 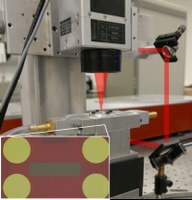 The possibility to adapt the beam shape almost arbitrarily to the application is beneficial for the productivity and flexibility of the laser process. LPKF sees potential for application in PCB processing (e.g. drilling of plated through contacts), glass processing and plastic welding and wants to evaluate and exploit this technology further. 3D-nano expects to benefit from the results of experimental research on the novel type of nanomaterials that is lacking today in the marketplace. It will therefore form the basis of a potentially substantial business opportunity for the company like 3D-nano. Kasischke, M., et al. “Graphene oxide reduction induced by femtosecond laser irradiation.” Nanostructured Thin Films X. Vol. 10356. International Society for Optics and Photonics, 2017. Kasischke, Maren, et al. "Simultaneous nanopatterning and reduction of graphene oxide by femtosecond laser pulses." Applied Surface Science 445 (2018): 197-203.